Researchers at Lawrence Livermore National Laboratory in Livermore, California have developed a new device for detecting viruses and other microscopic organisms to aid in medical diagnostics, bioterrorism threats, and product safety assessments. Capable of identifying any virus or bacteria keyed into one its probes, the detector can sweep for a wide variety of organisms at once or be configured to focus on possible bioterrorism threats, common medical problems, or any other grouping of microbes. 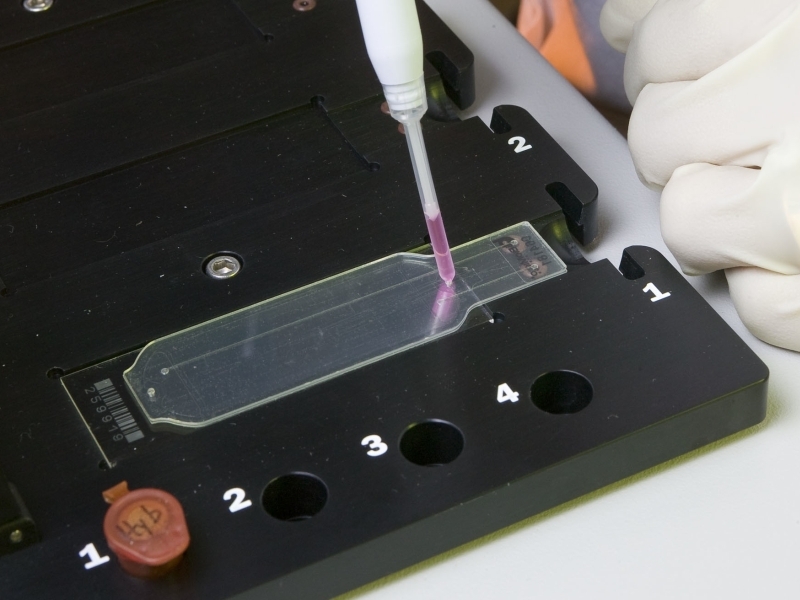 Called the Lawrence Livermore Microbial Detection Array (LLMDA), the device consists of 388,000 probes fitted into one inch by three inch glass slides. Each probe tests for one particular sequence of DNA. Small groups of probes with related sequences used together can check for specific diseases or other problematic organisms. The LLMDA can test for 2,000 viruses and 900 types of bacteria and can potentially check for the entire range of known viruses and bacteria in the future. The next version of the detector is already under development;it should include 2.1 million probes and be capable of testing for protozoa and fungi as well as viruses and bacteria. 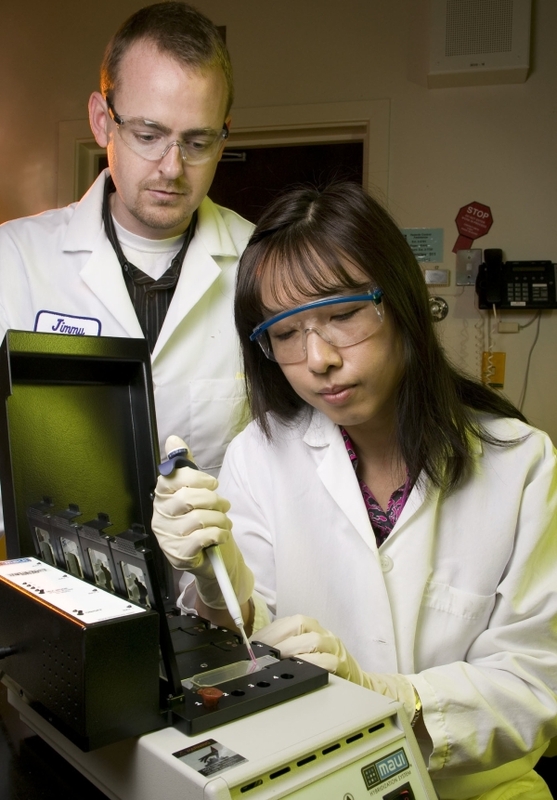 In contrast, current detection methods in wide use, such as multiplex polymerase chain reaction (PCR) techniques, generally handle no more than 50 organisms per use. The LLMDA has already been used to find traces of pig virus in GlaxoSmithKline’s Rotarix vaccine, used to prevent diarrhea in babies. Product safety rules require testing for specific known potential contaminants, but with the LLMDA testing can look for any contaminant present in large enough quantities to be potentially dangerous rather than just checking off that none of the listed contaminants are present. In addition, the LLMDA is undergoing testing for operational use against bioterrorism threats at the National Biodefense Analysis and Countermeasures Center of the U.S. Department of Homeland Security in Frederick, Maryland. When prices drop sufficiently, versions of the LLMDA could be used for standard medical diagnostic tests, greatly improving detection of disease in the general population. TFOT previously reported on other new detection technologies including the use of spectroscopy to detect pesticides on produce, early cancer detection using magnetic nanotechnology, saliva tests capable of detecting type II diabetes in its earliest stages, and a bra designed to detect breast cancer in its early stages. Read more about the LLMDA and its potential uses in this Lawrence Livermore National Laboratory press release. Read more about the role of the LLMDA device in Rotarix vaccine testing in this LLNL press release.